In the hilly north of Myanmar, a Chinese state-owned investment company was prepared to construct a massive 6,000 megawatt dam that would flood an area the size of Singapore. What seemed like a good idea at the time soon became a political debacle. Facing backlash from citizens, then-President Thein Sein was ultimately forced to halt the project. This was in 2011. In the years that followed, the Chinese government’s requests to continue the project fell on deaf ears. This year, Myanmar formally announced it would suspend the project due to environmental and societal impact. While the Myitsone dam project predated the Belt and Road Initiative (BRI), it showcased how complicated infrastructure and development projects beyond a country’s own borders can be, and foreshadowed the types of projects that were to come. As BRI moves through its fifth year, it faces arguably more pressure than ever before. Map of the Belt and Road Initiative via iStock. Plot twists like these are all too familiar for Chinese President Xi Jinping’s flagship project, and suspended projects are certainly not the only complication. China’s economy is slowing; fourth quarter GDP in 2018 fell to a nearly three-decade low. Foreign companies are projected to have weaker growth due to softening in the China market and Chinese companies, too, may find themselves harder-pressed to pay their debts. On the domestic political front, recent BRI loans have triggered a “wave of grumbling in China” from citizens who feel those funds would be better spent at home in a country that still defines itself as a developing economy. With economic stressors continuing to grow, how will Xi’s signature initiative to connect Eurasia hold up in the year ahead? One thing is certain: the Belt and Road is not going away. When BRI was first announced, called One Belt One Road at the time, China’s foreign currency reserves stood at some $4 trillion. In an effort to offload pressure on the yuan and provide contracts for Chinese companies, Beijing took an interest in spending some of those reserves overseas. Five years later, reserves have fallen to $3 trillion and hopes that BRI will help internationalize the renminbi now seem far-fetched. Chinese companies are often heavily saddled with debts that have led a record number into default. As noted in the Financial Times, “big Chinese state-owned enterprises that build, operate, and invest in many BRI projects are—on average—extremely highly leveraged.” In addition, if the fanfare around competitive neutrality from high-level Chinese officials is to be believed, and as more resources are spent to prop up private enterprise, state-owned enterprises (SOEs) may see their access to capital curtailed in the long run. If the cash spigot for these government-backed companies begins to dry up, future BRI projects may fall victim to the drought. Large SOEs are not the only ones facing economic pressure, though. In recent months, factory activity in China has been steadily contracting, with export orders falling at rates not seen since the financial crisis. At the same time, Chinese companies are facing stress from US tariffs, according to the American Chamber of Commerce. These headwinds for the Chinese economy may begin to whittle away at broad domestic support. Outside of China, 2018 also saw push-back against BRI from its biggest customers, with some recipient countries reconsidering what once seemed like generous offers from Beijing. A government transition in Malaysia jettisoned several projects and even prompted investigations into the major players that facilitated them. In the Maldives, the electoral defeat of a pro-China president in favor of the more skeptical Ibrahim Mohamed Solih lead to an ongoing renegotiation of BRI-related debt. In Sierra Leone’s capital, Freetown, the cancellation of a planned Chinese-funded airport marked the first termination of a BRI project in Africa. The list goes on. Despite these stressors, the most likely course for the Belt and Road this year seems to be one of recalibration. Economic growth in China is not the only engine driving expenditures on the Belt and Road; the program’s political support and significance to Xi Jinping and the CCP could be just as important, if not more so than its economic rationale. Even if China’s economic slowdown, as it is, shrinks the BRI budget, the impact would not be as catastrophic as the steady stream of ‘worst yet’ numbers might suggest. Economic growth in China is not the only engine driving expenditures on the Belt and Road; the program’s political support and significance to Xi Jinping and the CCP could be just as important, if not more so than its economic rationale. Although consumer confidence and the manufacturing PMI may look bleak, the initiative still maintains some domestic support. 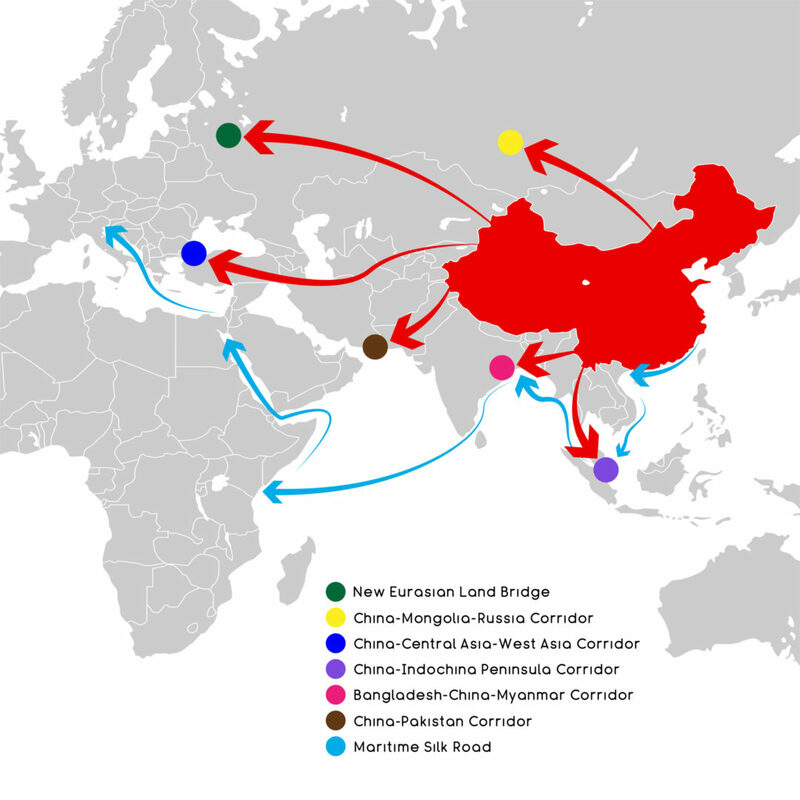 Jonathan Hillman, Director of the Reconnecting Asia Project at CSIS, points out that part of the reason BRI has not flopped is because many of its projects are undertaken domestically, for example, the upgrade to the airport in Urumqi, a major domestic BRI hub in China’s far west Xinjiang Province. Belt and Road projects also offer a pressure release valve for economic unrest, as workers from China’s Rust Belt are sometimes able to find work on construction projects dotting the landscapes of participant countries. This wide range of economic phenomena all have an impact on BRI, but they do not capture the whole story. To that end, President Xi recently experienced a major victory when Italy decided to join, becoming the first G7 nation to sign on. During the same trip to Europe, Xi stopped in Paris to meet with a more skeptical Emmanuel Macron, but still walked away with over a dozen commercial deals worth tens of billions of euros. Goodman notes that “certainly, [the government has] reined in BRI in the last year or so and that trend of consolidation is likely to continue for the period ahead.” But that doesn’t mean that anyone should be buying lilies for BRI’s grave anytime soon. Now a central element of Xi’s legacy, the chances of the campaign being axed any time soon are slim. If that is the case, opportunities may arise for foreign companies to fill those gaps. Given the current political environment in the United States, it seems possible that American companies could find support from the Trump Administration for more overseas investment if it was portrayed as eating China’s lunch. In a search for more responsible projects, increased American and foreign cooperation could offer a more sustainable path forward. The additional know-how, technical expertise, and experience in overseas markets could aid in everything from site selection to the provision of technical components that would make projects safer and more reliable. Perhaps such participation could even prevent quagmires like the Myitsone dam project. Unsourced quotations are drawn from interviews with the author. Chinese translation provided by Yue Chen.